The shimpaku juniper (Juniperus chinensis var. shimpaku) forest above was inherited recently by Dan from someone who made this forest 50 years or so ago in a workshop. Since it was first made it was never repotted at all and hardly styled other than to keep it in its original shape. Would you believe the tiny trees are 50 years old? That goes to show that one does NOT thicken a bonsai's trunk once it is in a bonsai pot and actively being kept to shape. Unrestricted growth is required to thicken a trunk or branches, and doing so in the ground is the fastest way by far! However, just because the trunks are thin did not make this bonsai hopeless to be stuck as a mediocre specimen. Below you can see some photos from Dan's first styling of the forest in December of 2016. After its initial styling, Dan wanted to complete the composition by marrying the forest to a spectacular rhyolite rock. The rock itself has many pockets and holes for light and details which would compete with any tree for the viewer's eyes, therefore Dan had to use a less powerful tree. 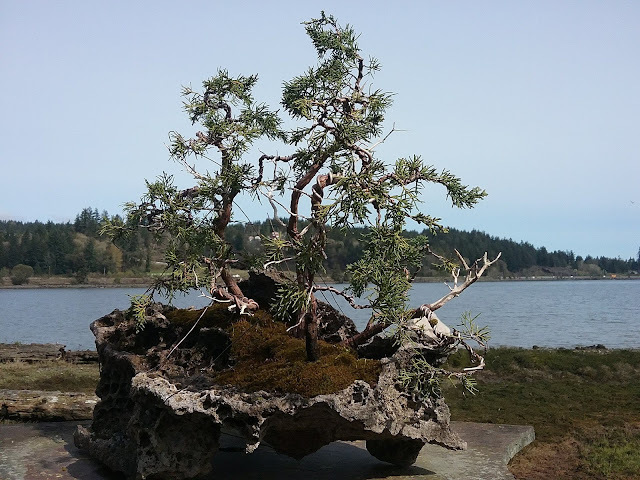 Prior to acquiring this tiny juniper forest though, he had nothing that would complement the rock appropriately (since he is usually into gnarly trunks and deadwood that themselves are meant to attract the viewer's attention. For decades, Dan has owned and awed over this rock while it waited for the right tree to enter the garden. In March 2017, we completed the union by repotting the forest into its new home. It was one of Dan's favorite trees by far that we have worked on lately and he was excited to hear what others in the bonsai world thought of it. There are a number of other special trees Dan planted into rocks this spring or in the past that I'll share in less detail. Most prominent are some tiny Chinese elms (Ulmus parvifolia) with dense ramification reflecting their 25 years in training as (pre-)bonsai. Dan got these trees a few months ago while on a road trip through southern California. The trees came at a surprisingly good price from Roy Nagatoshi's nursery - maybe due to their history together or due to the bulk of Dan's purchase there ($50 dollars each for 25 years of work is a little unbelievable to me otherwise!). Roy claims these are a special contorted variety of Chinese elm, but I am inclined to believe they are this ramified because of his hard work more than any genetic difference from normal Chinese elms. Many beginners start out their bonsai life with trees like these elms. Those with an unimpressive trunk and with little taper to me are not extraordinary and depict a young tree instead of a tree which captures my imagination. That is why Dan usually prefers to start his bonsai with a nice trunk (and prioritizes getting one when growing from seed) and that lack of an interesting focal point by his design philosophy is the dilemma Dan addressed with these rock plantings. The artistic goal for most of Dan's trees (as I have likely mentioned in previous posts) is to create a story of age and struggle. The scenes made by the rock plantings offer a unique opportunity for a small, young tree to tell a compelling story about its life struggle. To me, that is why these plantings are so cool. Anyone with young trees can do this once you find the right rock! For beginners who don't want to spend money or wait the time for a large trunk, consider making a statement with a dramatic rock like these instead. Below I have a few more rock plantings. I know I already have shared a ton of pictures and the categories displayed above easily could have been separated into two posts already, but these are cool and worth sharing too, I swear! Some of these final trees are a little bit border-line with two future post subjects I have been thinking about - landscape trees styled as bonsai (aka "Niwaki" in Japanese, pronounced similar to "Milwaukee", but with an N) and unusually large bonsai (the garden has many of both). However, all of these here are collected wild material (yamadori) and are growing on rocks or slabs - hence their inclusion. They just happen to be gigantic by bonsai standards. Bonsai plants are so fascinating. It is so strange how small they are in size despite their age. I did not know they had to styled a certain way. Yeah, there is a seemingly infinite amount to learn about the subject just from a horticultural stand point. You can pretty much style a tree however you want if you understand the basic techniques that we have available and what each technique can help achieve to alter the image of your trees. The penjing style clip and grow is a great one for beginners to start because it is easy to understand how to use it effectively. Do you now or have you previously owned a bonsai?